The Portland branch of Lithgow Library will be hosting a special guest, historian and researcher, John Low. 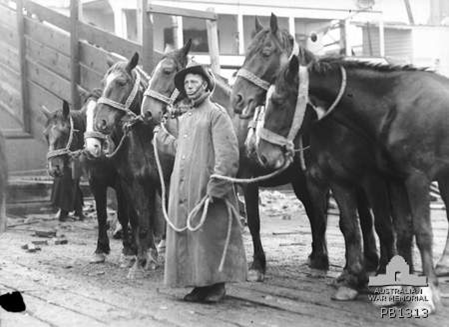 On Wednesday 2 August 2017 from 10.30 to 11.30am, historian and researcher John Low will present a history talk on the Anzac War Horses, in many ways not only workers but also companions to our soldiers. ‘Amid the stress and danger of the battlefield a strong and profound bond was often formed between soldier and horse … by looking at the war horse experience we can view WW1 from another angle…’ (John Low, 2017). Please contact Portland Library on 6355-5355 for any further information. Lithgow Library Learning Centre will present a photographic display and a morning of Family History discussions to celebrate National Family History Month during August. On Saturday 19th August 2017 from 10.30am to 12.30pm, special guest speaker Katherine Leighton will recount the story of her search for her birth family, ‘Finding Anne Watkins’, with a major breakthrough coming from Ancestry DNA testing. This talk will be followed by an open forum discussion of Ancestry DNA testing. “In a world with increasing access to technological advances even Family History research is seeing changes in the way people can find their extended families. National Family History month is a great opportunity to talk to others about this popular new trend in research,” said Lithgow City Council Mayor Stephen Lesslie. Guest speaker Katherine Leighton writes that she was born on the 9th January 1961 in Sydney and brought up in Lithgow by her parents Daphne and Bede Leighton, a past editor of The Lithgow Mercury. Together with her older brother Chris, they had a very happy upbringing. In 1981 Bede died suddenly and while looking for Bede’s birth certificate, Chris found both his and Katherine’s ‘Order of Adoption’ papers. Over following decades Katherine used all the information that had become available over the years relentlessly pursue her search, leaving no stone unturned. Join us to be inspired by the outcome of her search, hear the next family rumour to be pursued, and share your own Ancestry DNA stories of discovery. On display also for August are a series of Ancestor replica photographs taken by David Rawsthorne on location at Eskbank House and Katoomba. The photographs replicate four generations of the direct female ancestor line of Vicki Hartley, a well-known avid family historian and member of the Lithgow Living History Group. Thank you to Aunty Helen Riley who came along to Lithgow Library this morning for our special Storytime Session celebrating NAIDOC Week. Aunty Helen read a Wiradjuri story about a goanna, and showed the children some Aboriginal tools and a shell painted with traditional artwork. There were lots of action songs and Aunty Helen answered questions from the happy children. Thanks again Aunty Helen for a fun and cultural morning at the library! If you’ve ever wondered what the big deal is with Bob Dylan then this book is your chance to find out. Written by the man himself; Chronicles is an intimate and intensely personal recollection of his experiences from his earliest days in New York. Reading this book feels like you are sitting in a bar sharing a gin and tonic and chatting with an old friend. I highly recommend this read to anyone who loves Bob….or anyone who would like to meet him and find out why so many of us love and adore him. Join us next week for a special storytime celebrating NAIDOC Week. Come along on Wednesday 12 July 2017 for stories, songs and craft. We’ve had a mix-up for our planned session, with some fliers having the incorrect date, for which the library offers sincere apologies. We are happy to confirm our storytime will take place on Wednesday 12 July 2017 at 10.30am in the Children’s Area of Lithgow Library, with our special guest presenter, Aunty Helen Riley. This is a free event, and no bookings are required. Just come along and join in. Lithgow Library Uke’n’singers take their show on the road. This week the Lithgow Library Learning Centre’s own ukulele group hit the road for our first tour. On Tuesday we went to Tabulam Nursing home where we entertained the residents with fabulous renditions of popular songs from times gone by. On Friday we went to Cooinda and sang and strummed and danced the morning away with the residents there. In the same way that the Home Library Service brings the library out into the community; the Uke’n’singers bring the joy and fun of Community singing to some of those in our local area who cannot access the Library.